"Kiribatake" referred to the stretch of land along the shore of the "storage pond" (tameike), a reservoir which formed part of the outer moat of Edo Castle - today replaced by Sotobori-dori ("Outer Moat Avenue") from Akasaka-Mitsuke to Toranomon. Here lotus plants grew, scattered through the shallow, swampy pond. In the foreground are two paulownia trees with their gigantic leaves which were reported to have been planted here in the early eighteenth century and were probably intended as a decorative way to prevent erosion. 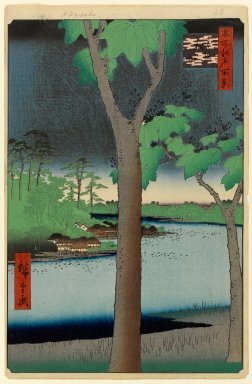 On top of the hill at the left is the Sanno Shrine whose festival was depicted in the previous print. The trees on the hill are in green printed over black with additional black over-printing on some of the trunks. The sky suggests a passing thundershower, very dramatic with a "baren" pattern printed over blue.